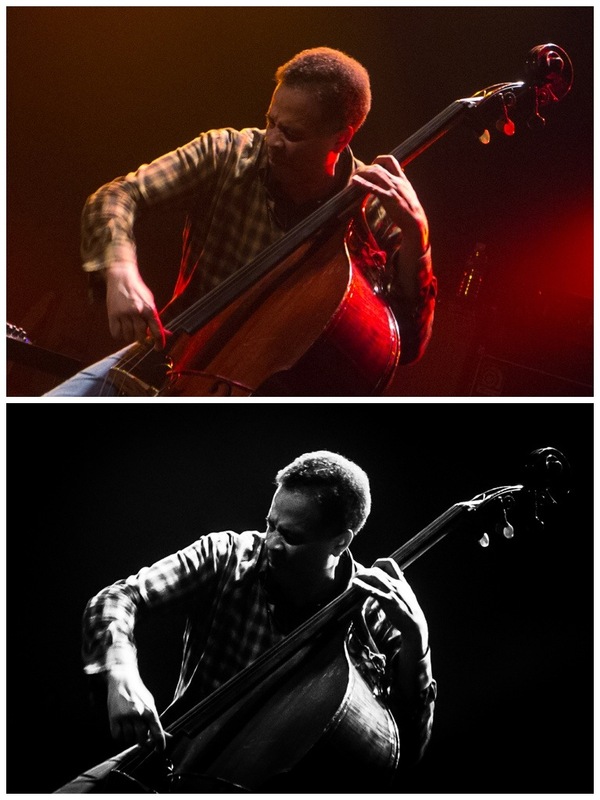 Above, a Stanley Clarke photo shot with the Panasonic LX-5 and very noisy as a result. Below, the same shot processed with XeL B&W in Lightroom. The final shot can be seen here. Early in the summer of 2011, I purchased Nik’s Silver Efex Pro, a very powerful tool to process photos for black & white results. The Silver Efex user interface is essentially to offer you a couple of dozens broad concept preset processes that you can then tweak to your heart’s content. In addition, the module lets you add effects like vignette, frames and many types of toning. For a few months I was content with Silver Efex and used it to produce great black and white shots. I did cringe a bit at the fact that each 20MB RAW file processed through Silver Efex came back as a 130MB TIFF file in Lightroom (in addition to the original RAW file, of course), but disk space is cheap, so I didn’t lose any sleep over it. In April this year, however, I edited two consecutive series of low light shots, one from a concert and one from dusk in Shanghai. Everytime I processed those files through Silver Efex, they came back looking exactly like I wanted them too… except that all the dark areas were specked with more noise than you get at an AC/DC concert. I first wondered if I was using Silver Efex right and did a lot of testing, but the issue wasn’t with me, it was with the tools. Inevitably low light shots, especially concert shots, have their share of noise in the darker areas (I usually try to shoot at 800 ISO tops, but even at that level, the darker areas get somewhat noisy). In Lightroom though, that noise is hardly noticeable, you have to zoom all the way to see it. But send that file into Silver Efex, and even if you don’t do a thing to it it comes back to Lightroom identical but specked with noise in the dark areas. Nothing that can’t be fixed with Lightroom, of course: a combination of noise reduction and local adjustments usually takes care of it. But I realized I was spending an inordinate amount of time in Lightroom fixing the damage done by Silver Efex on those dark shots. That’s not how I want to spend my processing time. I was also worried about how much damage might be invisible on screen but show up on prints. So I started editing these noise prone shots exclusively in Lightroom. At first it was a painstaking process. I was trying to get a specific look with so many tools at my disposal that it took me a lot of time and often multiple attempts. But I gradually discovered that I could emulate 95% or more of what I could do in Silver Efex in Lightroom. It took me longer, but it worked, and I had infinitely more control on the end result without the unwanted side effects. At some point during that process, I remembered that I’d purchased a whole set of presets back in 2010 from x-equals, a package called Cold Storage that emulated the look of old black & white and color films. I liked the concept, but the way these presets were structured made it a pain to nail a specific look for a specific picture, I had to go through a lot of trial and error. Still, I checked their website and found out that they had an upgraded package for sale that focused specifically on Black & White. So I went and purchased XeL Black and White and installed it. Since XeL Black & White is nothing more (or less) than Lightroom presets, installation is a breeze and everything stays inside Lightroom. What convinced me to buy this iteration of the film emulations was that unlike Cold Storage which took a piecemeal approach to modifying a picture, XeL Black & White decomposes the different aspects of the look into Mix (the actual B&W conversion), Tone and Grain. This gives you a lot more control into the final look without making the process any more complicated. In fact it makes it simpler, because with piecemeal presets if you don’t like specific aspects of the “look”, like the grain, or vignette say, then you have to dig into the menus to “undo” these parts. Here you’re in full control. When editing some concert shots with XeL Black and White, I further discovered an approach I’d never thought of before and couldn’t easily emulate in Silver Efex: when I’m unsure which will be the best way to process a black and white shot, I do a dozen or so virtual copies of my picture, then apply a different film emulation to each. I can then use Lightroom’s comparison tools to examine the approach that works best. Once I’ve done that, I eliminate the redundant virtual copies and focus on tweaking the shot exactly how I want it. All in all, I’ve now refined the process to the point where I’m not spending any more time editing black and white shots with XeL Black & White in Lightroom than I was in Silver Efex Pro, and I’m generally just as happy if not happier with the results. I’ve actually started going back to previously edited pictures now (not just low light shots) and “reproducing” the look I liked in Silver Efex Pro in Lightroom so I can cleanup these bloated TIFF files. U-points in Silver Efex Pro (and other Nik Software packages) allow you to select a small area based on its lighting and colour characteristics and apply local adjustments only to that area. In the end though, I used that rarely because the results rarely felt natural. I now prefer to work with Lightroom tools, although occasionally there’s an instance where having that click, adjust size and there you go option would be nice. Structure in Silver Efex Pro is better handled than Clarity was in Lightroom 3. I haven’t made side by side comparisons since Lightroom 4 came out, but the improvement on the clarity tool is such that I suspect I might no longer need to go to Silver Efex Pro for that extra clarity/structure boost. Frames is Lightroom’s big weakness if you like these things. In all fairness I use them rarely, they often feel tacky. I can also use Snapseed, which is a much cheaper Nik Software module (that I also use for grunging up my pics when I feel so inclined) for frames, so it’s not a big deal (although it would be nice if Lightroom finally addressed that natively). Vignette control is much better in Silver Efex Pro and that’s something I have found no way of emulating in Lightroom: in Silver Efex Pro you can decide where the center point of your vignette is. In Lightroom, the center is at the center, full stop (unless I’m missing something). Occasionally, particularly when editing concert shots, it’s interesting to be able to create an off-center vignette. By and large though, I feel that with Lightroom and the much cheaper XeL Black & White ($25 list price vs. $200 list) I’ve built myself an approach that gives me more creative control, less nasty side effects on picture processing and doesn’t create havoc on my available disk space quite as much. In the end, this isn’t about dissing Silver Efex Pro, it’s a great product. But both approaches have their pros and cons and for me the pros of staying in Lightroom and using a well tweaked set of presets such as XeL B&W clearly offset the cons I’ve highlighted above. Some may argue that Silver Efex pro is more powerful, which may well be the case but I suspect for 95% of photographers XeL B&W is a much cheaper route to what they use it for. In addition to the quality of the package itself, xequals offers great and responsive support, and they keep improving their packages and adding content to them. When I came back from holiday, I had an email saying they’d released XeL Colors, the equivalent with color film emulations. And guess what? It was free (instead of $30) for XeL Black & White customers. How cool is that?